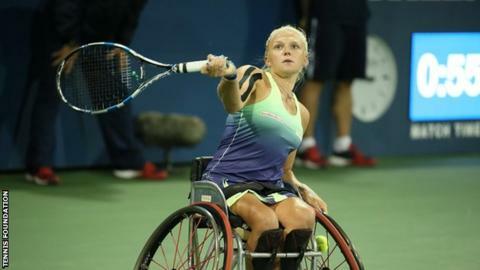 Britain's Jordanne Whiley won her first Grand Slam singles title by beating her doubles partner Yui Kamiji in the US Open women's wheelchair final. Whiley, 23, won 6-4 0-6 6-1 against 31-year-old Kamiji of Japan in her first appearance in a major singles final. Fellow Briton Gordon Reid, 23, won his second Grand Slam title as he paired with France's Stephane Houdet to clinch the men's wheelchair doubles. The top seeds beat French pair Michael Jeremiasz and Nicolas Peifer 6-3 6-1. "It feels like a dream," said Whiley, who was beaten with Kamiji in the doubles at Flushing Meadows. "I said at the beginning of the year that I wanted to win the singles title here and I've actually done it. "To play Yui, who is my best friend, was pretty hard. I know her game so well so it is an advantage but at the same time it was hard to see her in tears at the end. "I've always said to people that I'm not just a doubles player, I am a singles player and one day I'll show you. Today is that day and I'll take it further by winning more singles Slams."